Upon making the determination to evict a resident due to her habitual failure to uphold the terms of her lease, I sent a copy of the proposed eviction to the Ogden Housing Authority as required. 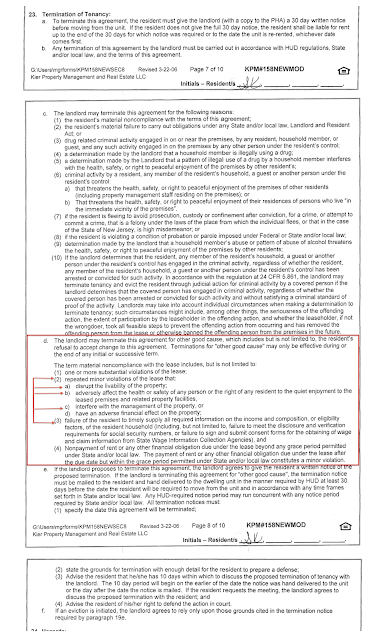 The proposed eviction was largely based upon paragraph 23, subsection d(2) of a lease the resident had entered into under Kier's management, in 2007. 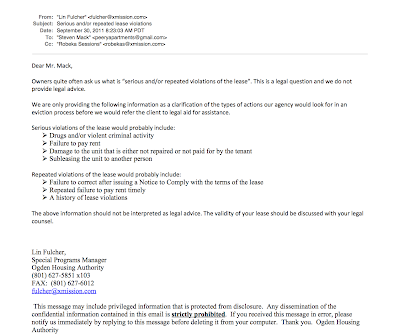 Less than an hour after serving this resident with a 30-day Notice to Vacate, I received the following e-mail from Robeka Sessions of the Ogden Housing Authority, stating that on a 30-day notice to terminate a lease under the Mod-Rehab Program, must be for "Serious and repeated violations of the lease". 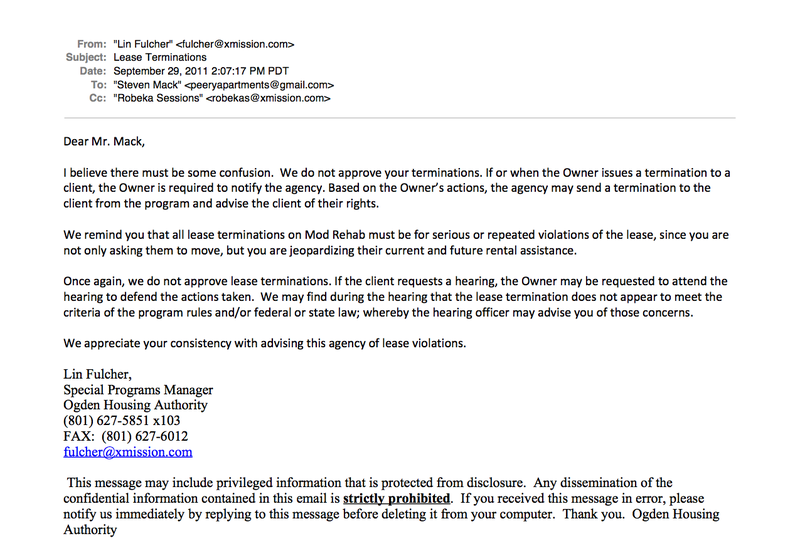 This response puzzled me because paragraph 23, subsection d(2) of this residents lease also provides for the termination of a lease for repeated minor violations of the lease. 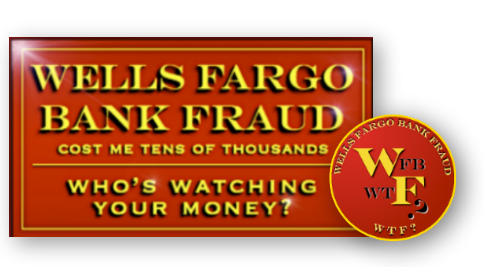 (shown below) Provided that the minor violations fall within the criteria specified. Interfering with the building's management by attempting to incite resident unrest. 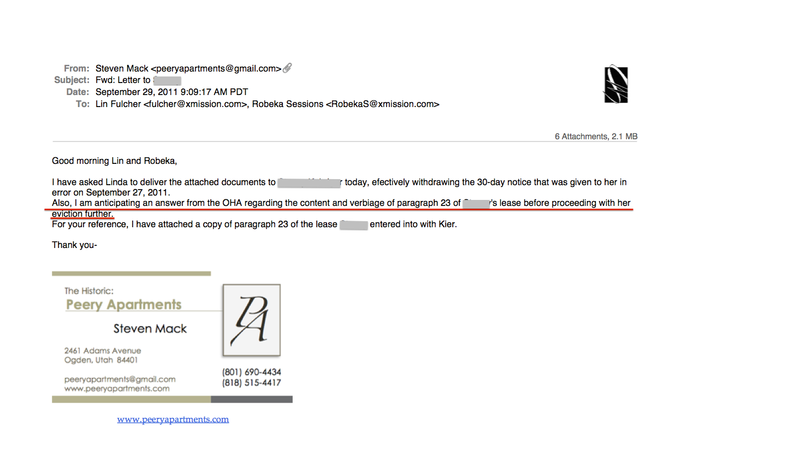 Obviously this resident had no intention of upholding the terms of her lease and further complained to the housing authority when the management enforced the lease terms she agreed to. 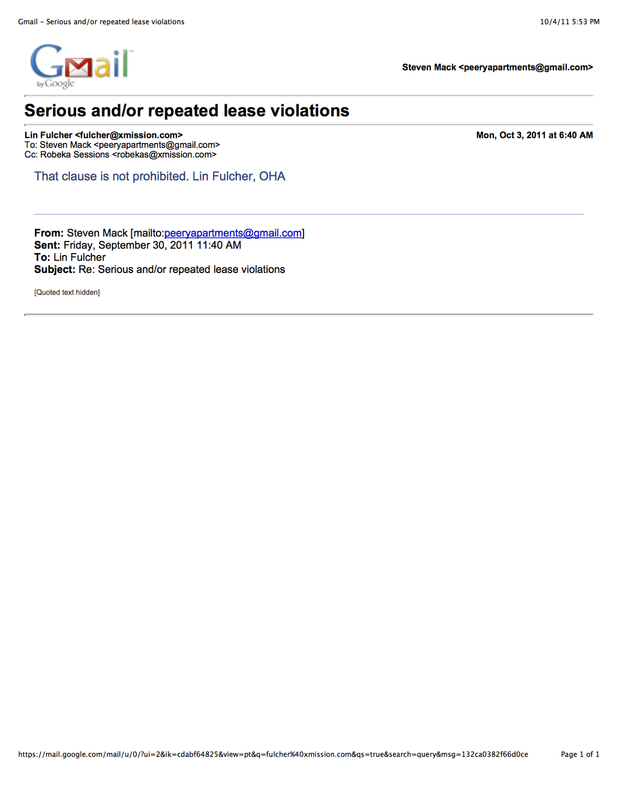 In May 2010, Lin Fulcher, the Special Programs Manager of the Ogden Housing Authority, notified me that the lease that Kier Management had been using for my property had been previously disapproved by their agency for prohibited content, but never specified to me what the prohibited content was. 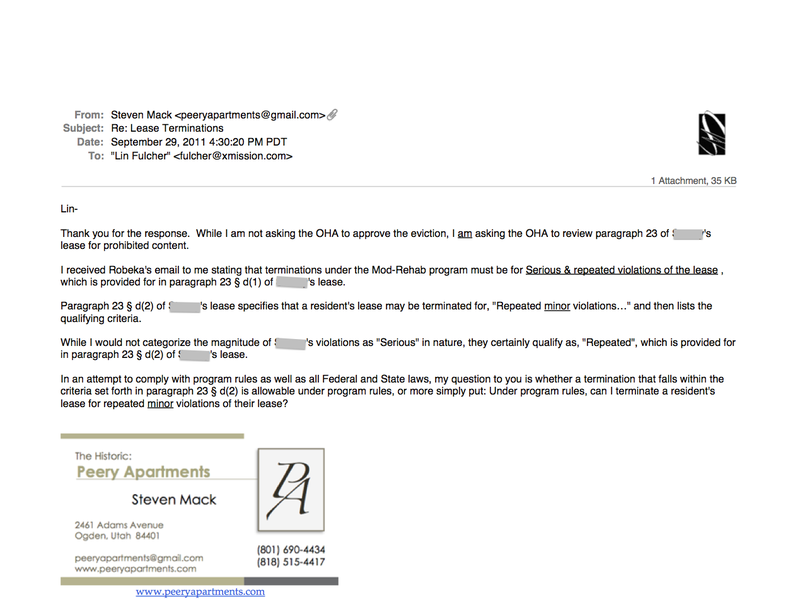 Given the email response I received from Robeka Sessions (above) regarding this proposed eviction, combined with Kier Management's propensity for continuing to use a lease that had been disapproved by the Ogden Housing Authority, I made several attempts to obtain confirmation from the Housing Authority that paragraph 23 of this resident's lease contained none of the alleged prohibited content. 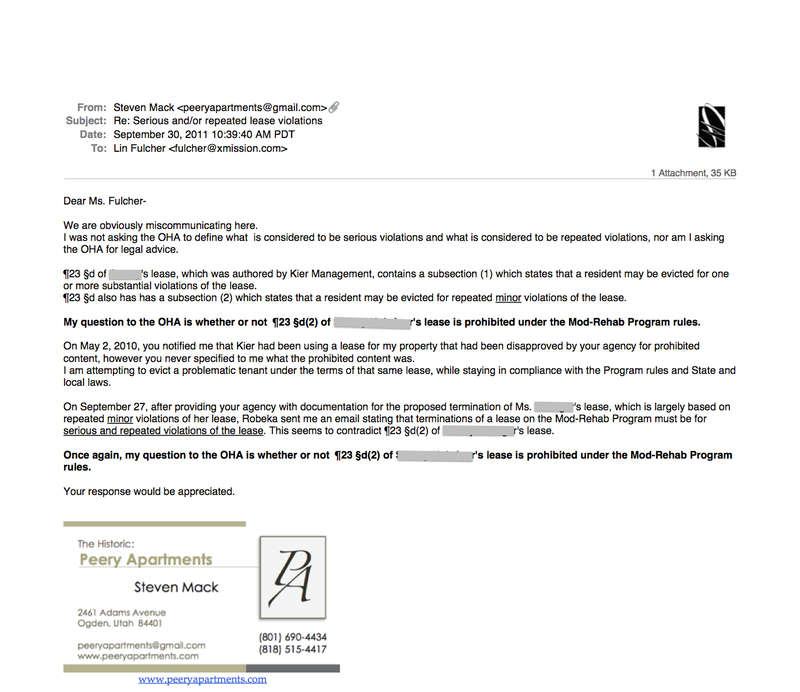 I responded to Robeka Sessions' email with this email and a copy of the lease paragraph in question, asking for a clarification... SHE DID NOT RESPOND TO IT. 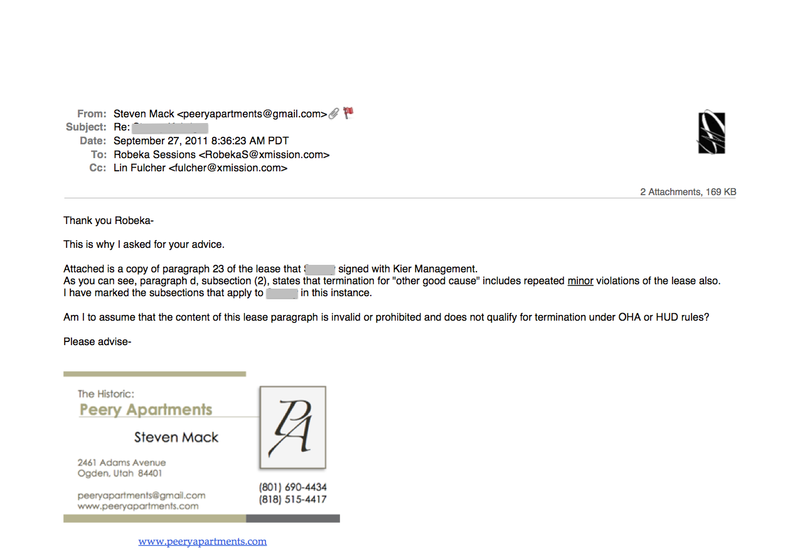 I made a second attempt to get clarification from the Housing Authority... THEY FAILED TO RESPOND AGAIN. 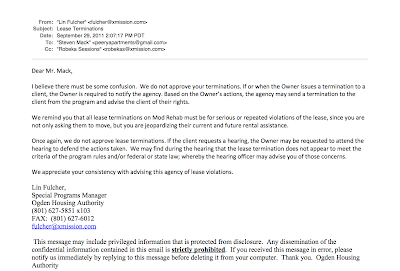 Because the Ogden Housing Authority repeatedly failed to respond to my question, I issued a withdrawal of the resident's 30-day Notice to Vacate until a determination could be made regarding her lease content, reminding them again that I was awaiting their response. 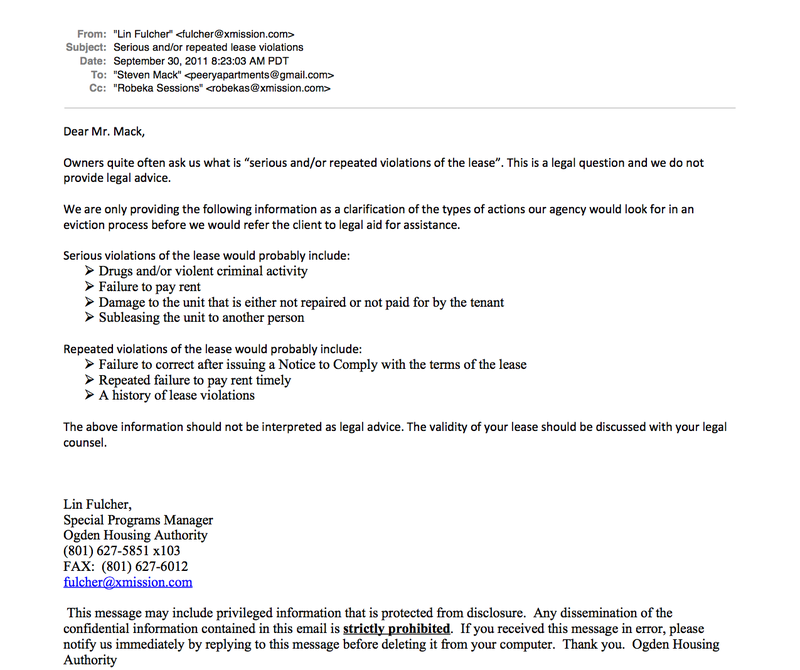 The Housing Authority finally responded with this email, 2-days after making my first inquiry, clearly oblivious to the question posed to them. 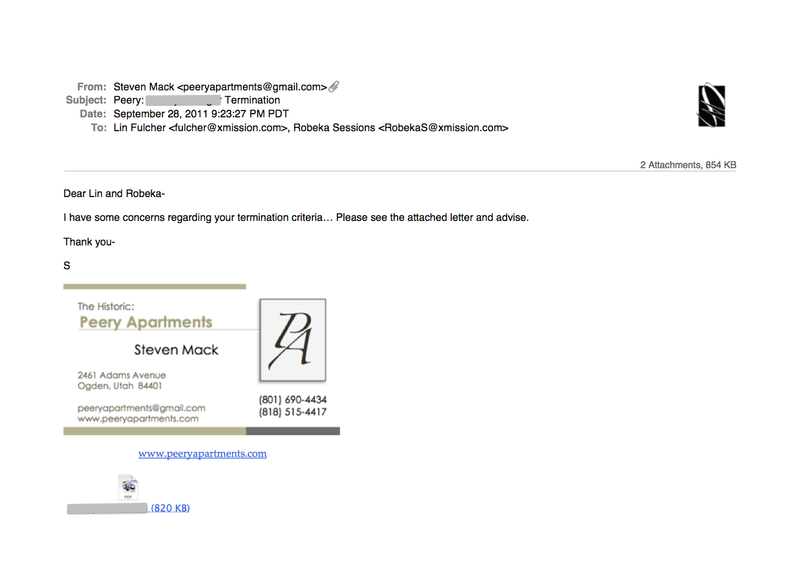 At no time did I ask the Housing Authority to approve this termination. 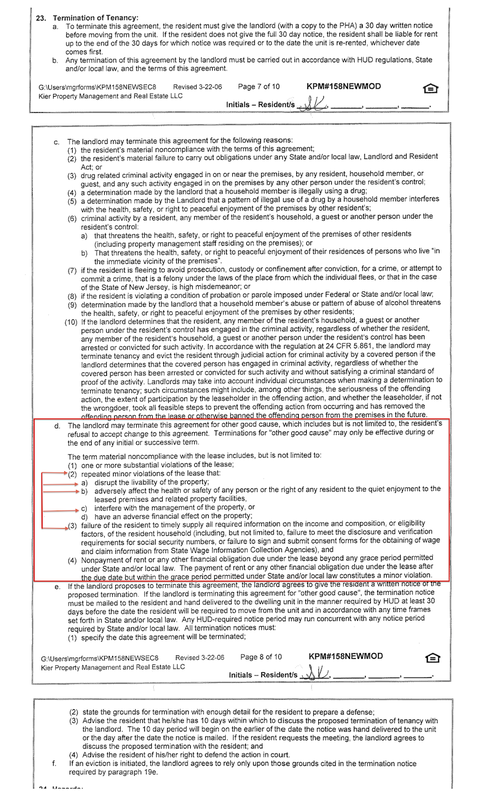 The question posed to them was whether the content of paragraph 23 of this resident's lease was prohibited under the Program. Rather than providing an answer, Ms. Fulcher reiterates the information provided by Ms. 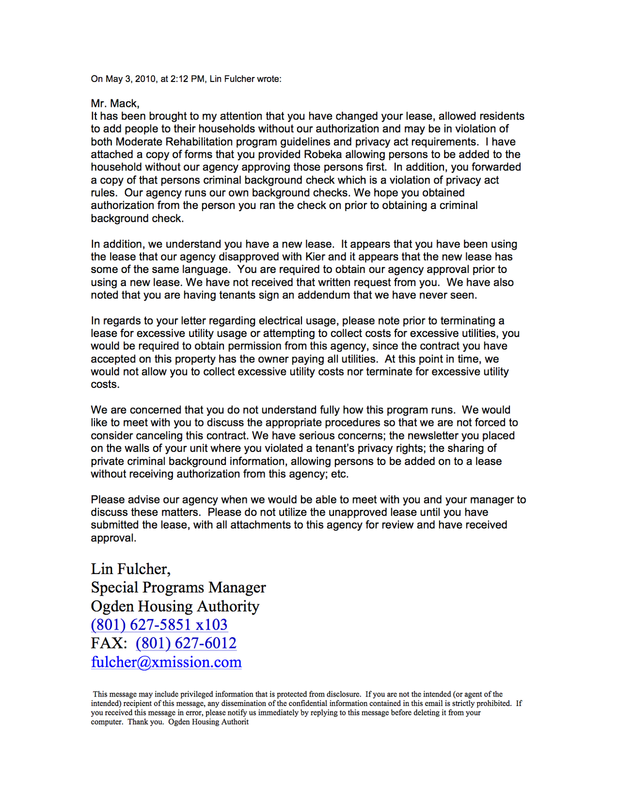 Sessions, making the subtle, but obvious change in verbiage from, "Serious and repeated violations" to "Serious OR repeated violations"
I responded to Ms. Fulcher, pointing out to her again that I had not asked the Ogden Housing Authority to approve the termination. 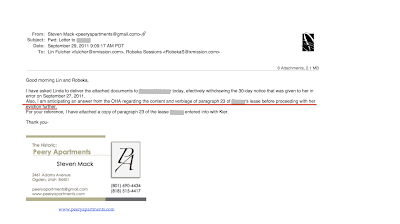 What I was asking them to do was to review paragraph 23 of the resident's lease for prohibited content. 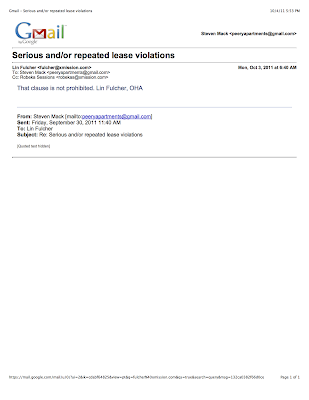 Ms. Fulcher responded to me with this email, skirting the question posed yet again, defining the difference between "Serious" and "Repeated" violations of the lease instead. Honestly? 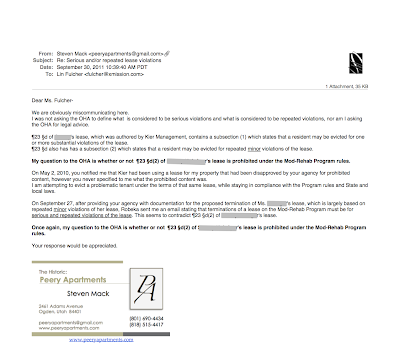 I don't know how I could have possibly been more clear or articulate in posing my question to the Housing Authority, yet they repeatedly failed to answer it. 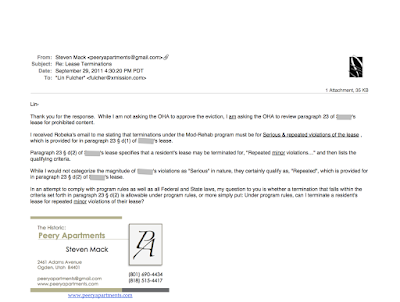 In this email response to Ms. Fulcher, I spell out my question to the Housing Authority once again, reminding her that she had previously informed me that there was prohibited content in this resident's lease and that given Ms. Sessions original response to me, I had very real concerns about this particular lease paragraph. 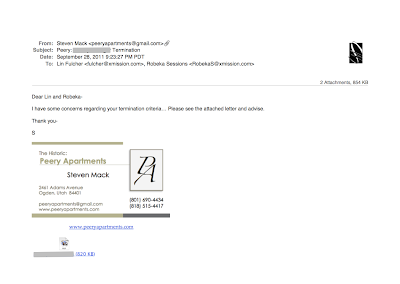 After 5-atempts and 6-days later, Ms. Fulcher finally provides the answer to my question.... Sheesh! 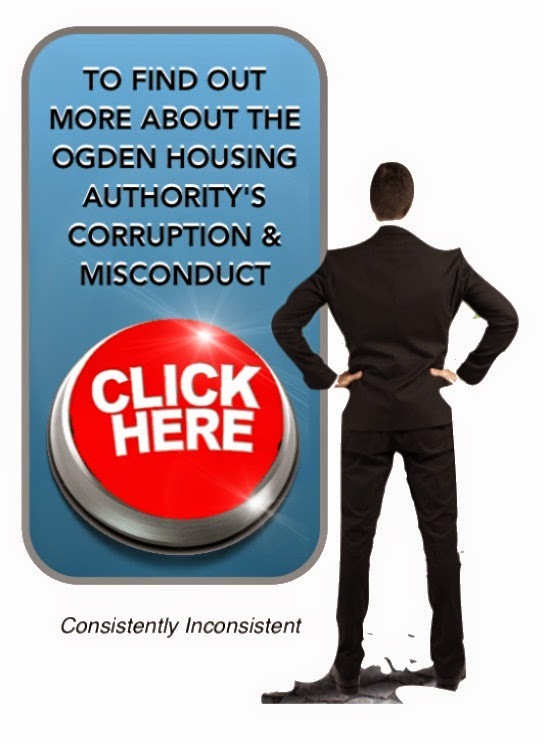 Yet another example of problems within the Ogden Housing Authority. Ask them one simple question regarding the inconsistency of the information they provide and you get a 6-day run around on the OHA merry-go-round.